Please note there is a grill on lower balcony and not a tub. 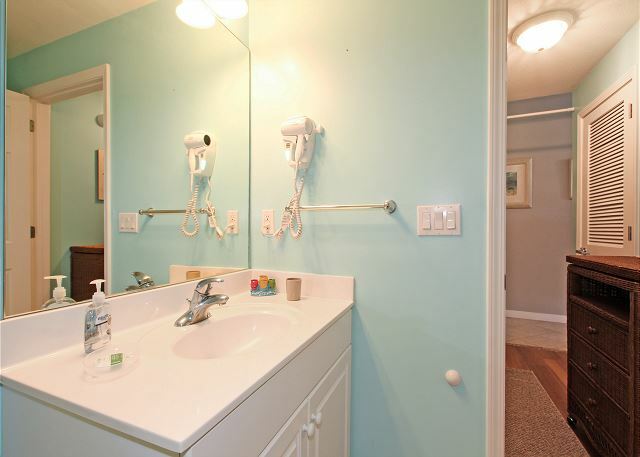 This condo has a private garage that you are allowed to use during your stay. 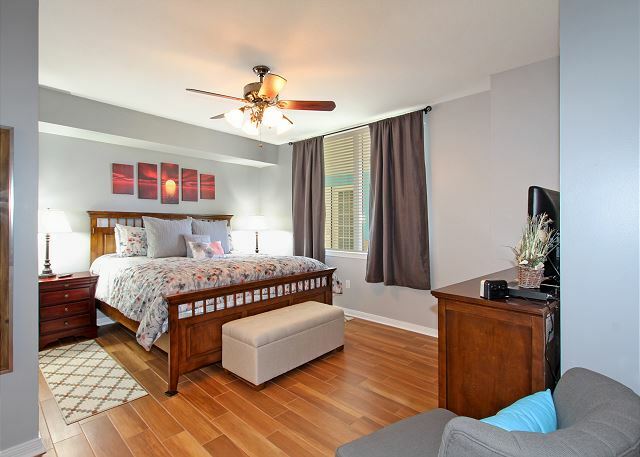 This beautifully renovated condo is perfect for families with children. The ground floor location offers walk out convenience to the many pool amenities and the lazy river. From your central location you can be in the lazy river or zero entry pool in seconds, grill on your own private grill, or just sit on the lanai (patio) and watch as your family and friends float their cares away in the lazy river. 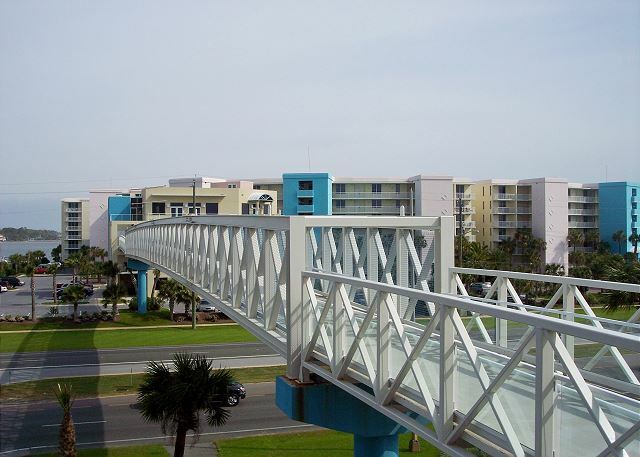 Access to the beach and gulf side amenities where your family can enjoy the 5000 sf pool and the gulf is a short/safe distance away using the overhead pedestrian walkway. Owner provides private parking garage for guest parking. 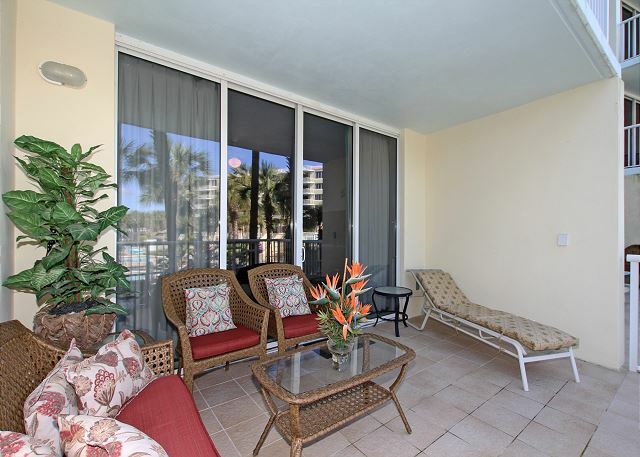 The condo is furnished with everything you and your family will need for a great vacation. The kitchen is fully stocked with stainless pots and pans, a toaster oven, carafe style and single serve style coffee makers, slow cooker, blender, and all the dishes and utensils that you will need for a quick snack or a full meal. 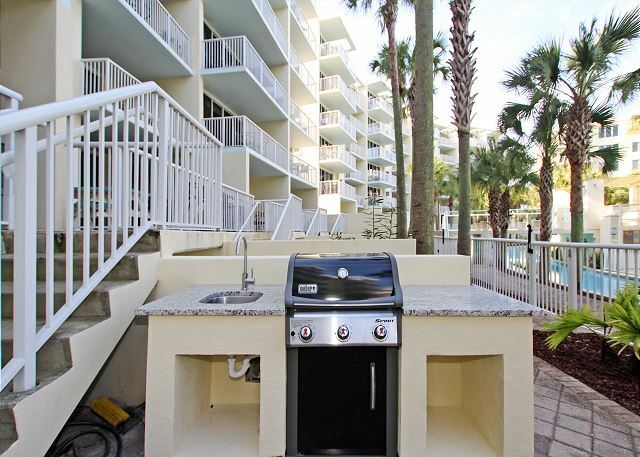 The outside lower balcony features a Weber bar-b-q grill so that you can continue the cooking to the outside if you so desire. There is also a Pack & Play and booster dining chair for children. The dining area has seating for six at the table and breakfast bar and the living room has a sleeper sofa with a memory foam mattress, recliner, accent chair, and a Samsung 50" smart television with DVD player. Bring your login information to access Netflix, Amazon, etc. or enjoy one of the 70+ DVD movies furnished for your viewing pleasure. Cable TV is furnished as is free WiFi for computer access. You can also enjoy the electric fireplace with or without heat. There are night lights built into several outlet plates to softly illuminate the hallway, etc. during the night for your safety. An outlet in the kitchen and one in the dining area have built-in USB charging ports. Air conditioning in this unit also has an air purification system. The bunk room has twin bunk beds with a 24 inch smart tv at the end of each bed. 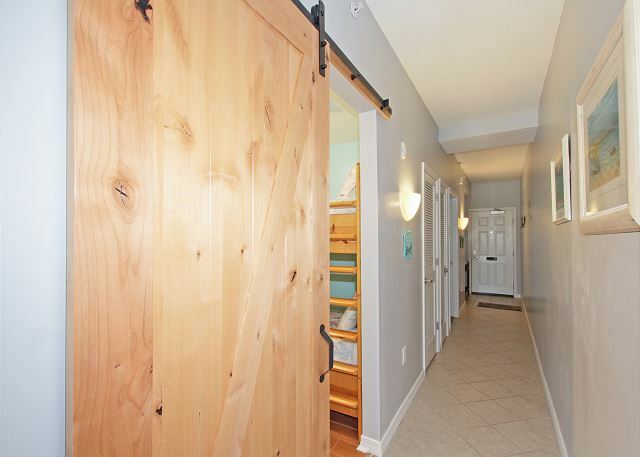 The bunk room has its own bathroom with shower and the kids will love the new sliding barn door. 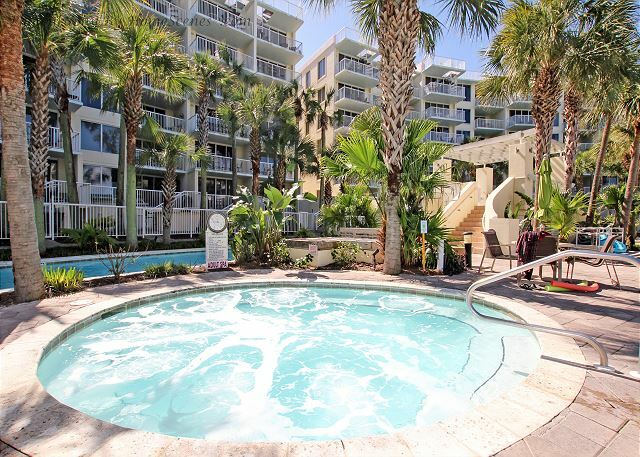 Lanai condos are in high demand at Destin West as they offer you everything needed for a great vacation. The raised upper lanai affords you a wonderful place to relax and enjoy the sights and sounds around you while your dinner is cooking on the new grilling island. 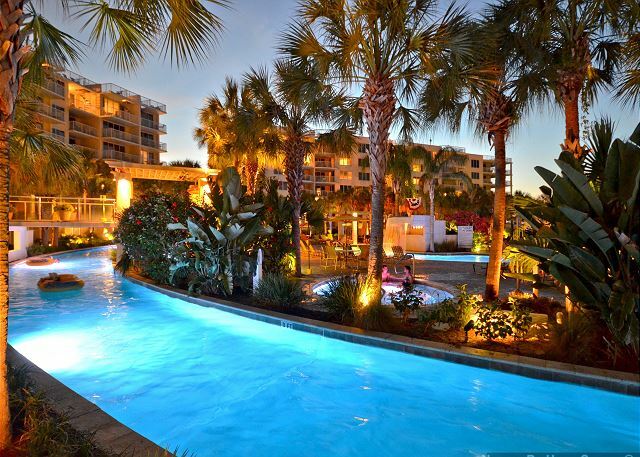 Destin West offers access to a 5,000 square foot swimming pool, a waterfall pool, three large hot tubs, heated pools in the winter, and a never ending lazy river. 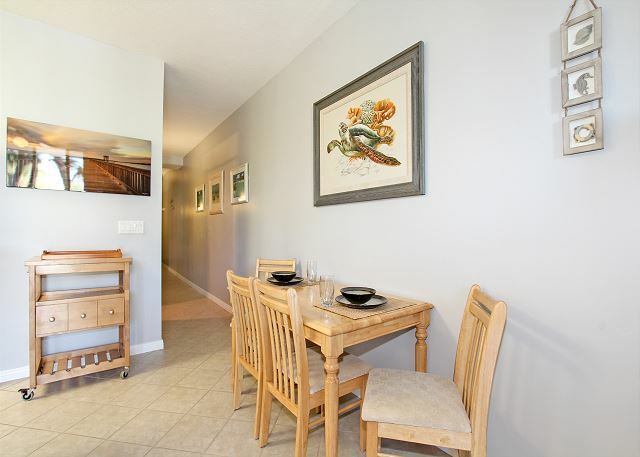 Enjoy a short walk along the sugar white sandy beach to restaurants, the fishing pier and Boardwalk from this condominium . The Island's Restaurant and Arcade is right next door and Adventureland is about one block west. Pontoon boats, jet skis, and other rentals are available for rent right next door on the dock behind The Island Restaurant. We also manage VRBO# 152697 on the same floor as this condo. ****All reservations require a $49 property damage protection fee which covers up to $1500 in damages. Reservations made online will be billed the $49 automatically. PLEASE DO NOT PURCHASE DAMAGE INSURANCE THROUGH VRBO AT THE TIME OF BOOKING AS THIS WILL BE A DUPLICATE CHARGE. TRAVEL INSURANCE ALSO OFFERED BY US. *****Effect. 4/19/2017 any new reservations made using American Express will be added a 2.5% credit card fee. The condo and facilities have everything needed for a great stay for families with kids of any age. Dear Mr. Crain, Thank you so much for taking the time to leave this 5 star review! We love hearing from our guests and are happy you enjoyed your time in L-05 Sandpiper! We'll be ready to help you book your next stay whenever you're ready to come back! We had a wonderful time. Even my husband who is usually very picky was happy all week. We went fishing with the owner’s son Josh and had a great time. From the ease of booking with Robyn to the spotless condo and the great resort I can can think of nothing to complain about. Restaurants nearby were great. Lived Rickin Tacis. We have already booked our next years vacation in same condo. Yea! BTW! We loved using the garage. Dear Ms. Stierwald, Thank you for sharing your experience in Sandpiper L-05! We love hearing from our guests and are so pleased you enjoyed your stay with us! We'll look forward to having you back again next year! Room was clean, spacious and had everything we needed. The private garage was huge for loading and unloading as well as always having a spot to park. If you don't care about a "view" ground level is the way to go. It makes pool access easy plus you have a grill. I have stayed on both sides of the resort and would highly recommend this room to anybody, especially if you have kids. Dear Mr. Phillips, Thank you for leaving us this wonderful review! We have a condo for everyone! 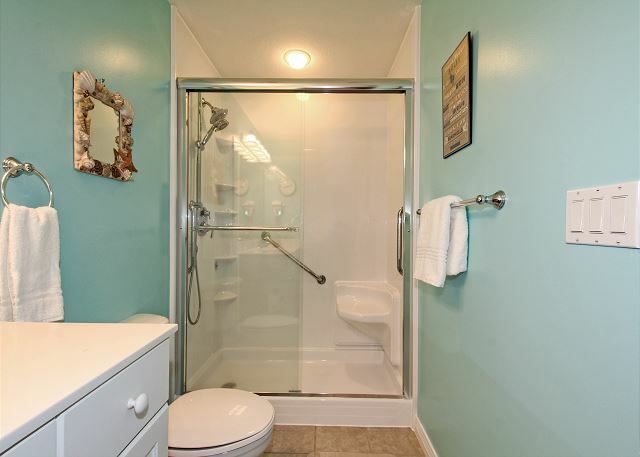 I'm so glad that we found one that was perfect for your needs! Please let us know when you're ready to come back! Sandpiper L05 (June 2018) was clean, felt newly renovated and fully stocked with everything (non-food) needed for a great beach & pool vacation. The garage offered easy parking right under the unit and access to the lanai grill level and back porch overlooking the palm trees and pools. We never used the front door. The garage had many beach toys, umbrellas, floats and a cart to roll everything to the beach. 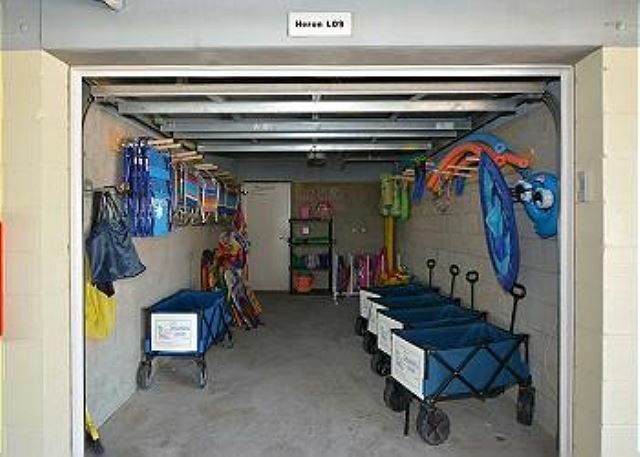 The shared garage had even more chairs, wagons, boogie boards, sand toys and umbrellas. The gas grill was newer and clean. There were plenty of DVDs. We had a blast watching “Grease”. The main room Smart TV is very new playing Netflix, Apps and movies on a USB if you bring them. I brought my Google Chrome Cast which worked great. Bring your own family games and reading material. 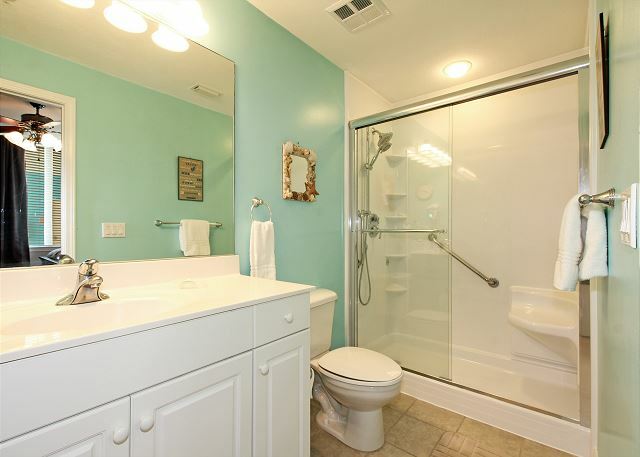 The entire property was beautiful, well maintained, safe, clean and friendly. We loved the lazy river after a hot day on the beach. The beach was emerald and clear with differing conditions each day; some very calm and others yellow flag days with decent kid boogie board surfing. The back harbor was shallow and clear offering good wading and catching small fish, crabs and conchs with nets. Destin West is a kid/family-oriented place. It is very calm and quiet after 10pm and before 9am. My pre-teens were adventurous throughout the property and met other kids while my introverted older teens enjoyed the AC, fast internet and TVs in the bunk room more than the pools & beach. We walked everywhere. The pier was fun watching folks catch fish. We had drinks and dinner at both the **** Trap & Rockin Tacos restaurants which was very good and with no waiting. Wild Willy's Adventure (Dinosaur theme) park was fun too with the ropes climbing, game room, 4D theater and well-designed putt-putt course. 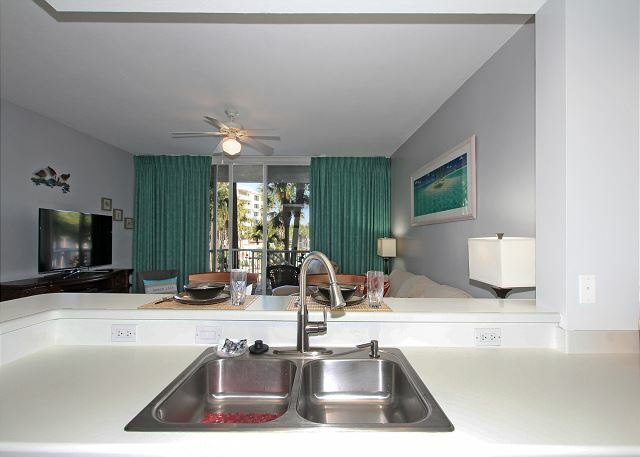 We would highly recommend Destin West and Sandpiper L05 for a great week at the beach. Dear Mr. Barr, It sounds like your family had an AMAZING time! Thank you so much for taking the time to leave us such a stellar review! Please bring your family back again soon! 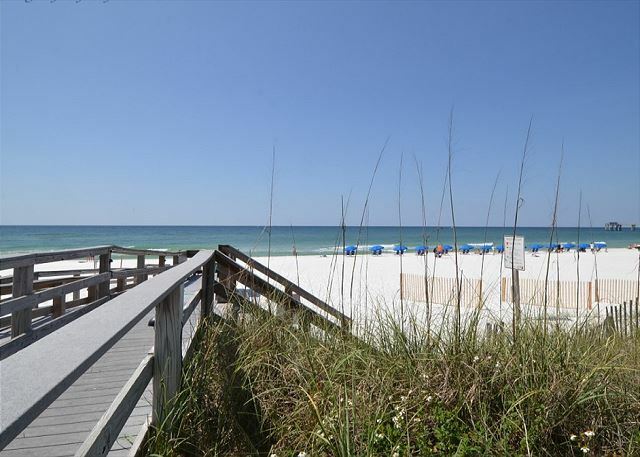 When vacationing in Destin we usually choose a condo directly on the beach. However, after staying at DestinWest we now have a new favorite condo! It was perfect for a family vacation! 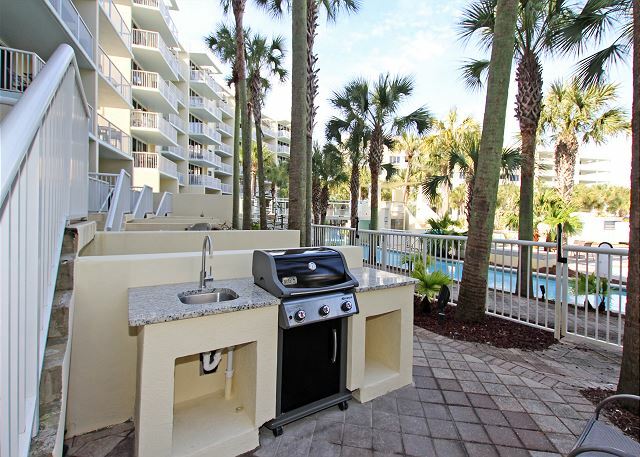 The private grill area is right outside and the lazy river is mere steps from the back door! Not to mention the bay is directly behind the pool area, where my son and I caught many crabs. The beach is just a short walk across the bridge. This is definitely our new favorite vacation spot and we will be back! Thank you for leaving us such a wonderful review! I definitely agree that the Bayside is perfect for young families! We'll be looking forward to your next trip! I loved everything about my recent stay. The location, cleanliness and responsiveness of the owner. I had the best time in the Destin area and coming back to the condo at the end of each day was bliss! I'm so happy to hear you enjoyed your time here! Thank you for taking the time to let us know. We're ready to book your next trip whenever you are! Sandpiper L05 condo that we were moved to was great. Julie had to arrange a condo swap since SandpiperL01 was not available due to a medical emergency. Julie was able to help the people from L01 to extend their stay. Just 4 doors away was L05. Right in the center of the court yard to access the swimming pools. Location was great. Our condo was so nice I would be proud to own it. There is nothing I would change. The condo was clean, in great shape, looked nice, was very comfortable, and had absolutely everything we could possibly need. It was great. I would like to return to Destin West. Julie is a true professional. Robyn works for Julie and also does a great job. She will give you 1st class service. We loved it there. Dear Mr. Stierle, I'm pleased to know that we were able to move you to a wonderful condo! We strive to provide the absolute highest quality services to our guests and are so grateful knowing when it pays off. We will eagerly await your next booking! This unit was exactly as pictured. It was clean and contained everything we needed for our stay. The complex was well kept and the people friendly. The management responded quickly to an issue with the dishwasher. I will definitely consider this complex if we return to this area in the future. Dear Ms. Blanck, We're so grateful for your kind comments! When things go wrong, which they sometimes do, it is definitely a priority to us to take care of our guests as quickly as we can! Thank you for choosing to stay with us and we'll look forward to having you back again soon. My family and I stayed here in Late September. First impression when arriving was that everything was so clean! 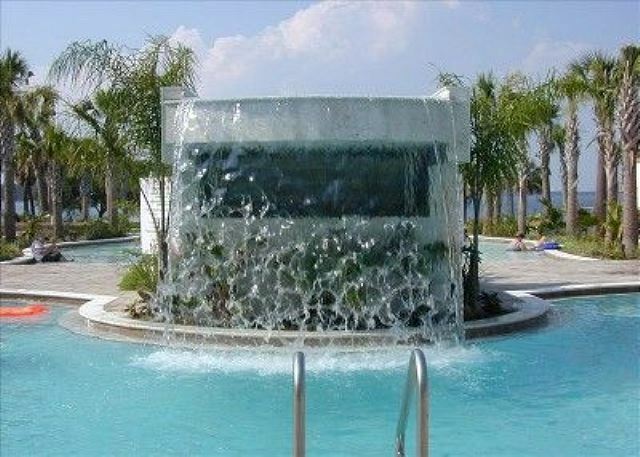 This condo is perfect for a small family with small kids that needs quick easy access to the lazy river and pool area. Dear Ms. Angelle, We're a family business and truly love reading reviews like these! We're so pleased you enjoyed your stay and found it to be so clean and comfortable. Providing a clean, comfortable environment for your family is very important to us! Please let us know when we can book your next trip! We had the BEST vacation at Destin West. It was our first time renting a condo and we loved it. The condo was in a great location - loved being on the ground floor with easy access to the lazy river and pools. It was nice having a private garage with everything we needed for the beach. The condo was beautifully furnished and so comfortable. The kids loved the bunks with TVs. We grilled out a couple times and even watched a family movie. It was such a great vacation we're already talking about when we can come back! Dear Ms. Ostermeier, I'm so happy to hear about the wonderful time you had while on your family vacation! Condos truly provide that home away from home experience, don't they? We're always here and ready to help plan for your next visit! We love staying at Destin West! The only complaint I had this time was that the lazy river was closed for a few days, which rarely ever happens. We know they had no control over it but it was still a bummer. Dear Ms. Martin, I'm so sorry for the inconvenient timing of the Lazy River closure. I am so glad that you still enjoyed your time at Destin West and was able to utilize the other amenities available. Thank you for recommending us to your friends and loved ones! We look forward to your next trip! Our stay at DestinWest was as fabulous this year as it has been all the previous years. The only complaint we had was we had two beach towels stolen through the night that were hanging out to dry. We loved the convenience of the lower floor condo but found it erie that people can walk right to your patio with your personal belongings. Sarah, thank you for your kind words about our condo. We are sorry to hear about your beach towels. This is actually not a common occurrence but we will definitely speak to security to let them know about this. We hope to see you back soon. 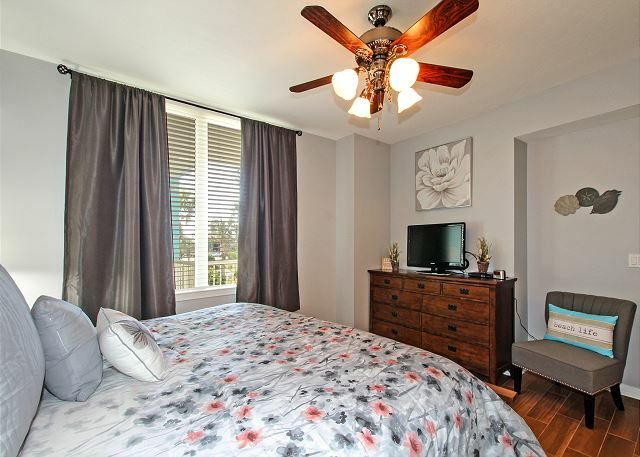 Beautiful Destin Condo, Great for Location for Family! Beautiful condo, as described on site. Easy to access just off the elevator. Walk right out the sliding door to the pool & lazy river. We needed a few extra towels & contacted the property manager who responded promptly. The walk to the beach was not a bad walk with the overhead bridge & very easy to find. Plus the other side had 2 large pools for the kids so an added bonus. I liked the phone app they sent for info about the area before our trip & easy check out. The garage was an added plus, kept us from searching for a spot. My one & only slight complaint was that there was no key provided to the sliding patio door or garage. Making it a bit hard to fully enjoy that amenity. We enjoyed our trip & look forward to coming back again! Shannon, thank you for your kind words about our condo. We are so glad you enjoyed all of the little touches that we provide. We hope to see you back soon. Wonderful Location, great Accomodation, Clean, Spacious and Beautiful over all. The Best in Destin. Management was very attentive and Helpful. There were mang amenities including the Lazy River which my Kids Loved. We will stay here again next year. This is my 2nd stay at Destin West and this condo is my favorite. It's beautiful and absolutely as described. 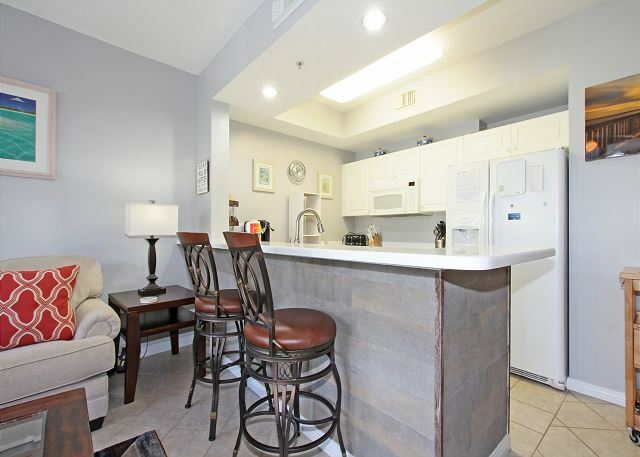 It has EVERYTHING you need to prepare meals, coffee, mixed drinks, wash clothes....you name it and it's in this condo. Including chairs, wagons, beach mats, etc. for the beach in the garage! If you go out the sliding glass doors you're on a beautiful patio with a grill and patio furniture below and a few steps away from the lazy river. Our family hopes to go back next year and stay at this same condo. Thank you for thinking of everything for a perfect vacation! Condo was very clean and met our expectations. Besides the tropical storm Cindy it was great! It was very helpful the chairs, umbrellas, and other toys were supplied in the garage. In addition, we loved we had a garage spot every night! We liked being on the bottom floor with the grill and walk-out. I was nervous being on the bottom floor because I thought we would hear people above us but we never had that problem! It was a short walk to the beach which wasn't a big deal, we actually liked being closer to the pool for easier access for the kids. Our kids are 5 and 2 and they loved the bunk beds! 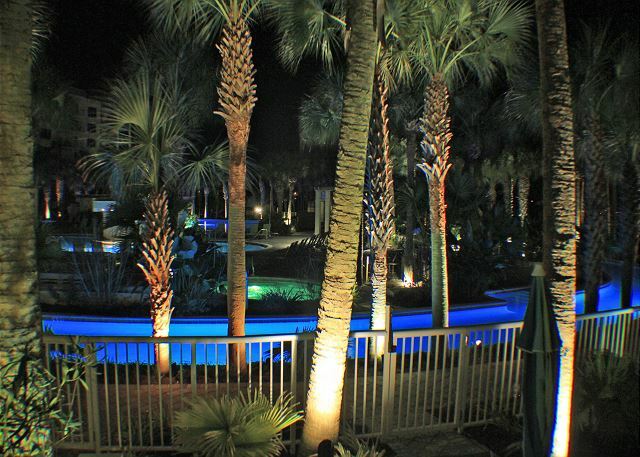 Loved our stay at destin west condos! We stayed in the sandpiper l-05. We loved it! The pictures do not do the condo justice. Very clean and had everything we needed. The property manager and housekeeping staff were very pleasant. Having the convenience of walking to the ocean or walking out to the lazy river made it different from other places we've stayed at in destin. Already looking to book again for September. Hi Jesse! Thank you for the great review. Let us know what dates you are looking for in September and we can make it happen. We look forward to having you back. Thank you for the great review. Take care! Great location, beautiful view. Short distance to grocery and many restaurants. We have stayed in many rental units but this condo by far exceeded them all. The décor is stunning and the kitchen is stocked with any appliance or gadget you could possibly need. Being a lanai unit, it allowed us to walk right out our patio and in to the pool area. The property amenities included an adult only hot tub, pool and lazy river. The pathway off our patio led us right down to the bay where there were benches, picnic tables and even bbq grills for our use. Parking in the private garage was a nice perk and the supplied beach chairs, umbrellas and boogie boards a wonderful touch. Kudos to the owner and management team - we will definitely be back!! The condo was very nicely done. There weren't any amenities that we could have wanted, everything you need was there! Altho we did not go in the lazy river, other guests were enjoying it, and it was so clean! the pools were well maintained, as was the hot tub. The heated pools were a real treat. Shopping is close by, as are a lot of good places to eat.